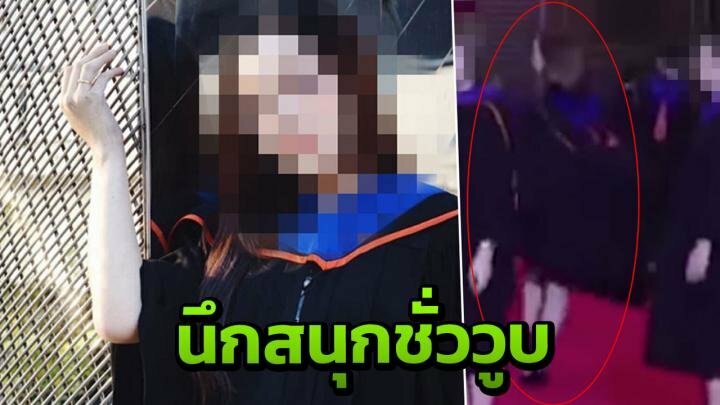 A ladyboy graduate who did an impromptu pirouette after getting her degree certificate at Bangkok University on Saturday came in for a storm of criticism. Such events are steeped in tradition and all participants must follow a strict routine when being presented with their degrees. But in a video that was shown on national TV after being posted on Facebook the recipient does a full turn before exiting the stage. Thai Rath TV said many people condemned the move. The graduate is a lady boy who later went on her Facebook page to apologize. He said he got caught up in the excitement of the moment and wanted to have a bit of fun. The uni had advised everyone of the protocols and he regretted breaking them and has learnt a life lesson. He apologized for the inappropriate behavior. Oh Pleeze why so much fuss about such a move....the stupid traditions need to change plus they should realize that most their thai degrees are not even worth more than toilet papers! That why all the elite send their kids overseas! Shameful. Lock him up. Her. Them. It. Whatever. Nothing wrong with this at all. She, he, ze, could almost make an excuse that she, he, ze didn't know which way to turn and just spun around confused. There has to at least some minor confusion in there, being a ladyboy and all! the Nothing wrong with this at all. She, he, ze, could almost make an excuse that she, he, ze didn't know which way to turn and just spun around confused. There has to at least some minor confusion in there, being a ladyboy and all! Great to see some creativity added, I am sure "the royal" who spent the day being bored was somewhat amused with the originality. Yep, so he/she just made it formal on this particular night. I've been to a couple of graduation events for relatives of my wife in Thailand and they are pretty dire and boring. I can't remember my graduation much except that I had an almighty hangover! Chaos theory again, chaps. The act of a Thai lady boy pirouetting at his/her graduation ceremony in 2019 somehow connects to one of Maggie Thatcher's speeches in 1980. Oh my god, how dare she spin twice. Should be locked up for at least 12 months. Bangkok University is private one. So no royal.